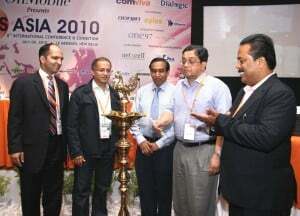 A look into VAS ASIA 2010 the prospect of Value Added Services becoming a huge industry with a turnover of Rs 100,000 crores annually by 2020 emerged at VAS Asia 2010 event. According to OnMobile Chairman and CEO Mr. Arvind Rao VAS would be a “transformational force” and even by 2015 when its turnover would rise from Rs. 15,000 crores now to Rs 50,000 crores it would be a larger industry than advertising or media. Over 2.5 lakh villages would be connected to wireless broadband and 3G by 2012 enabling them to access the whole range of value added services, said DoT Secretary Sh. P. J. Thomas inaugurating the conference. The entire lot of panchayats would be connected through optical fibre and computers providing them broadand services, he revealed. 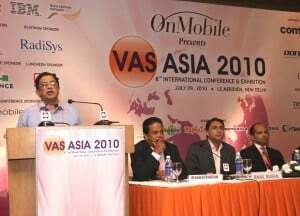 From ringback tone the next big money spinner for the telcos would be Mobile VAS, Mr. Rao said. Though VAS was providing only 10 per cent of the revenues for telcos, within this decade the situation would be reversed with value added services ringing 80 per cent of the revenues and voice revenue shrinking to 20 per cent. The trend abroad was for services like mobile music, moile video, mobile TV, smart phones, converged devices at home enabling users to switch between fixed and mobile phones, use of mobile for social networking and a host of other services on the mobile phone. The OnMobile chairman envisaged a world where the mobile service providers would act as a “bank’ among several other services they would provide covering health, education, entertainment, life style, personal services etc. Sh. P.J. 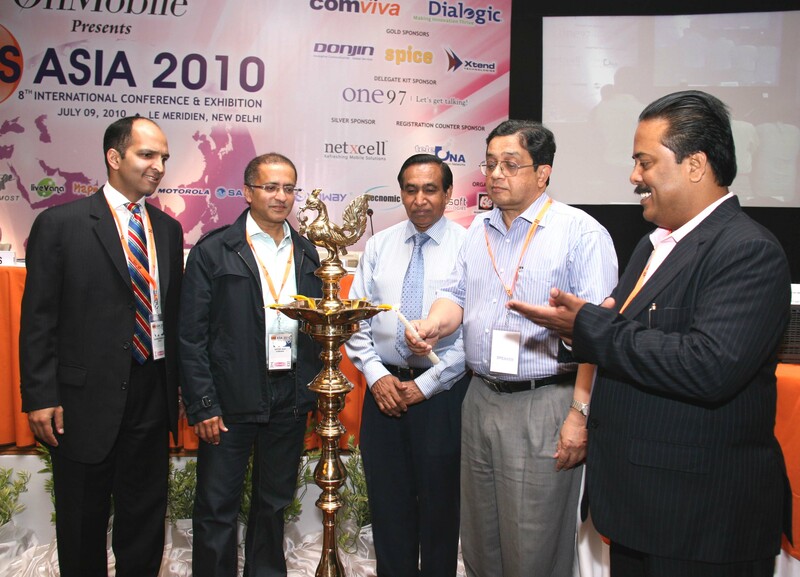 Thomas – Sec, DOT, Ministry of Comm & IT lighting the inaugural lamp at VAS ASIA 2010. Revealing the technology of micro-charging that was emerging, Mr. Rao described how it would enable customers to enjoy short clips, film reviews and entertainment, and interactivity on a scale never imagined earlier. Farmers could raise and find answers to immediate problems. However, the industry would have to resolve problems like revenue sharing between the telcos, content providers and technology vendors. 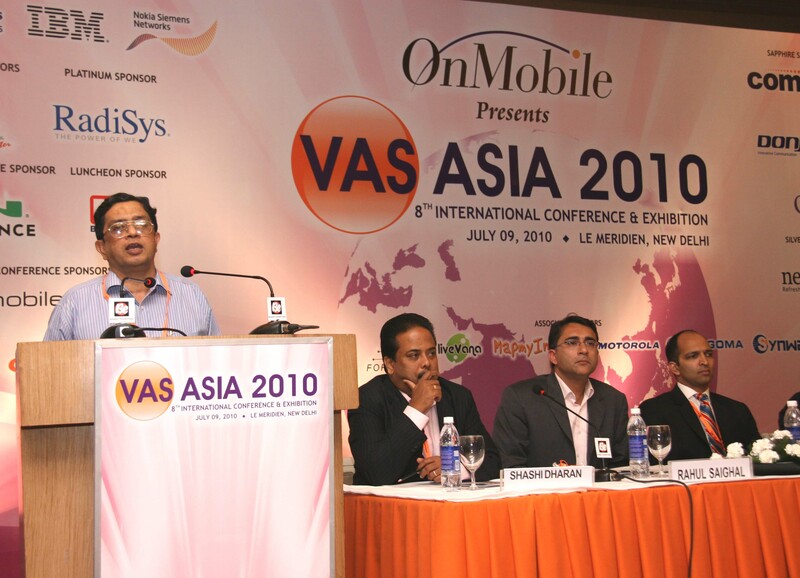 There had to e close co-operation between handset makers and VAS for this scenario to unfold to its full extent. “India has a real chance to be the world’s largest VAS innovator due to its 1.2 billion population and its diversity but government has to promote this by providing support like tax benefit” Mr. Rao pointed out. A glimpse of the emerging video world where you could converse and see the person of your choice at the press of a key, where a range of entertainment would open up at will, where education and healthcare as well as information would be connected within seconds and many other services would be within immediate reach was provided in a video presentation by entertainment leader Shemaroo Entertainment Director Mr. Jai Maroo. 3D pictures and videos would be available on the mobile or on the PC at all times. The access to LCD TV would be available to over 400 million mobile subscribers on their phone, he predicted. The providing of multiple vision facility would transform every one’s lives as the experience in three dimensions becomes ubiquitous, Mr. Maroo said. “Video calling will be a reality with 3G as soon as it gets rolled out” he predicted. “It would be video on the go” in the coming years. “We have an opportunity to transform the world” said Airtel vice-president for marketing and business head Rakesh Mahajan detailing how his company was going to use its recently acquired 3G airwaves to enrich customer experience. However he suggested that telecom operators should aim at providing sustainable value in VAS and not just rich customer experience. He projected cross industry, cross community services to arrive on the back of 3G airwaves. These and other projections of the vast range of innovations on mobile phones on the move were the subject of presentations by Aircel CMO Rahul Saigal and Idea Cellular Chief corporate affairs officer Rajat Mukarji. Public sector telco BSNL was even now providing 3G experience to its subscribers in 450 cities and towns, said R. K. Aggarwal, director of consumer mobility in the countrywide company.He also revealed that another 250 towns would get the benefit within the next five months. Can anyone please tell me what will be the status of 2G gprs once the 3G is rolled out by the liceses ? -Will 2G gprs stop ? -will it become cheap ? -will the speed increase ? -will the subscribers have a choice of selecting 2G or 3G ?